'His contagious smile and peal of laughter, his affirmative approach to national challenges, his faith and conviction in India's future and his profound attachment to the welfare of the northeast attracted anyone who came in touch with him,' says Dr Anirban Ganguly. Purno Agitok Sangma's rise on India's political firmament was not due to a bequeathed legacy or the result of the boons of dynastic connections and computations. The short boy from Garo hills had to struggle his way through and yet what was perhaps remarkable in Sangma's personality was his intrinsic and unshakeable faith in India, in her essential democratic spirit and framework and in her capacity to triumph and to march ahead. The last few years of his life, one saw him as an ambassador or an advocate of the need to ensure that our democratic traditions and frameworks were adequately protected and perpetuated. In fact, it was a spirit and framework that Sangma himself did much to strengthen, widen and deepen throughout his political career of nearly four decades. For a boy who laboured during the day and trudged miles to attend classes in the evening, Purno Sangma's rise to the chair of the Speaker of the Lok Sabha in the world's largest democracy was indeed a long and arduous march, but one which nevertheless set an historic example of the possibilities that India's vibrant democratic spirit of equity and of justice offered. It was also, in a sense, the expression of the unique attributes of the Indian democratic framework which has given opportunity for the marginalised, the cornered and the neglected to rightfully rise through the ranks and to achieve distinction and to excel. It was his sparkling intelligence, ebullient nature and capacity to grasp and master the most intricate details that endeared Purno to many. His teachers still recall his tenacious nature, his indomitable interest in India's democratic experiment and the manner in which he persisted to rise out and beyond the confines of a corner into which he had been born. It was this aspiration which eventually made him one of the most effective voice of India's northeast in Delhi and on the floor of Parliament and also turned him, for a while, into one of the most recognised among Indian leaders in the world. While he carried the northeast and its multi-dimensional aspirations in his heart, Purno also brought the world to that region by becoming an effective spokesperson of the regions hopes, aspirations and challenges. In every portfolio that he handled, Purno displayed a level of mastery and meticulousness that was rare. His performance as Union labour minister, his deft and inspiring handling of Parliament and the grace and dignity that he lent to the Speaker's chair commanded admiration across India and beyond, making Purno a household name. It was that pan-Indian acceptance of the short boy from Garo Hills that emerged as a moment of triumph for the spirit of India's diversity and of oneness. For some in his team Purno's rise also became a cause of envy and consternation. His rise through the ranks and the increase of his stature through the dint of his performance and ability and his eventual challenge to the entrenched spirit of dynastism in the Congress party displayed his grit and the force of conviction. His determined stand -- at the peak of his political career without attention to his political future -- on the issue that India cannot have as prime minister a person of foreign origin was perhaps the other high peak of his life. Purno never regretted that decision, though it took a heavy political toll and the Congress 'high command' never forgave him that act of 'indiscretion.' The dynasty-led Congress, of course, lost an opportunity to declare a tribal from the northeast as its prime ministerial candidate. A quintessential nationalist, Purno always found himself arraigned on the side of nationalist formations. His formidable effort in 2003 to create, in coordination with V Satish, then the BJP's in-charge of the northeast, the Northeast People's Forum by bringing together regional parties of the area was done with the aim of giving them a decisive voice on the national scene. For Purno, the northeast and India's interest were integral and paramount and thus he never played the false and faded card of political 'untouchability.' Few remember the NEPF experiment today but it was a refreshing effort to synergise divergent political aspirations and voices from the region and direct these towards a wider horizon and platform which would command recognition and attention. In 2012, again the irrepressible force of his conviction saw him side with the NDA and the non-Left and non-Congress formations and take up the gauntlet of the Presidential race. His participation in the race lent greater seriousness and stature to the exercise -- for Purno it did not matter whether he lost it, a given, with the formidable forces arraigned against him. He had to make a point, to convey a message. Narendra Modi's resounding victory in 2014 saw Purno rejoice at the shift that he saw Indian polity take towards a certain decisiveness and stability. During the gruelling and crucial election campaign, Purno's last electoral battle, he did his bit in the northeast projecting the message of change, of hope and of a new beginning. He had worried and worked himself up over the fact that in the past decade India had a prime minister who was not directly elected and was controlled by extra-Constitutional authorities and bodies who had little sense of accountability to the people of India. His insistence and conviction that the prime minister of India must be from the Lower House and must be directly elected in order to feel compellingly responsible to the people was belied in the UPA but was vindicated in May 2014. Interestingly, his difficult growing up years, his near-endless struggles never turned Purno bitter, he was never heard complaining of his circumstances or casting calumny on society or his country. Instead, deciding to take control of his fate Purno altered the trajectory of his life and to an extent of his country. Never was heard from his lips the demand for separation, or the fear of being discriminated against. Purno was grateful that his country and his people gave him so much, reposed in him so much faith and made him what he became. His contagious smile and peal of laughter, his affirmative approach to national challenges, his faith and conviction in India's future and his profound attachment to the welfare of the northeast were aspects that attracted anyone who came in touch with him, especially the youth whom he could attract and inspire. Purno Sangma's life was thus an instructive one; especially in the present times when for some it is de rigueur to call for separation, destruction and dismemberment of one's own mother country while articulating a false and degenerative narrative of victimhood. Purno's narrative, on the other hand, was an affirmative one which inspired an entire generation. He will be sorely missed. Dr Anirban Ganguly is Director, Dr Syama Prasad Mookerjee Research Foundation, New Delhi. 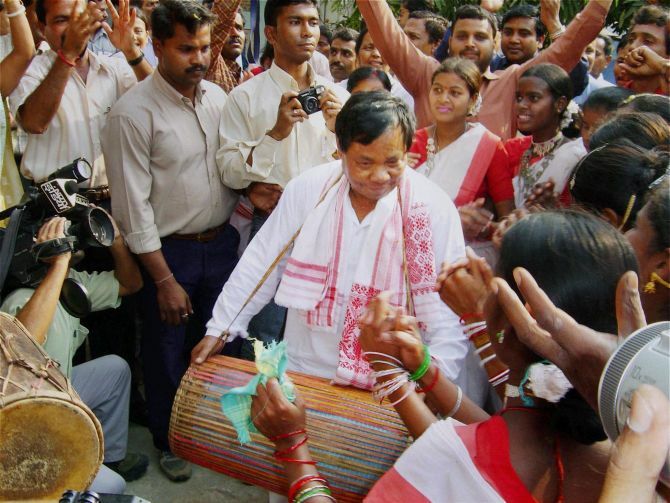 Why are Jayalalithaa and Patnaik rooting for Sangma? Why not include the north-east in IPL-4?